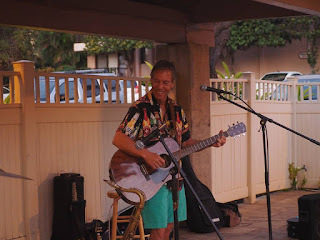 December 1, 2016 /in Blog /by Andrew S.
Artie is a fellow owner at the Kihei Akahi Resort. We are part-time neighbors. When my vacation rental is vacant I like to do my staycations in Kihei. 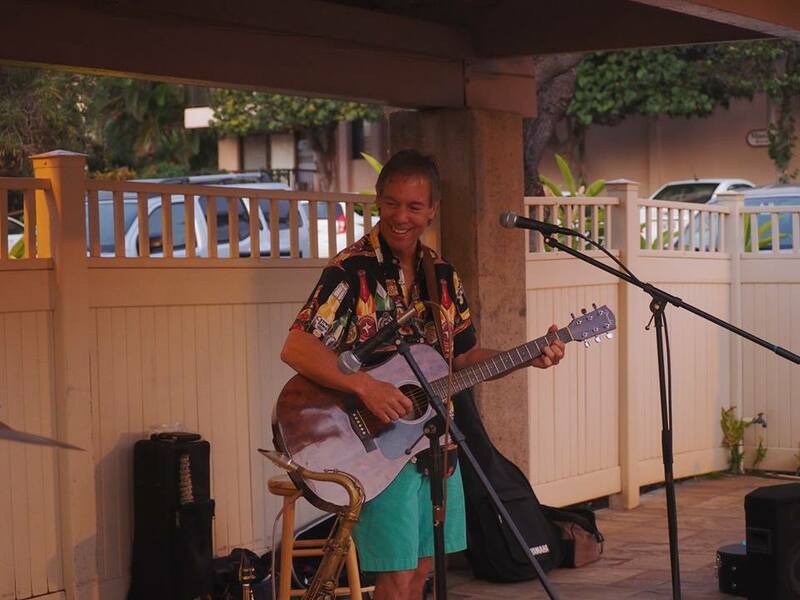 I have seen Artie perform at some of our pool parties with other talented musicians who own at the Akahi. We have a good group here. Artie is positive and a lot of fun, perhaps it is because he is a “party” entertainer for a living. He is a very interesting person and has lived a very interesting life. I am happy to interview him for my blog. Kathy: How did you create your business being the “party man?” When did this business start and tell us how it evolved into your career. Artie: I had worked for 4 city Recreation Departments as a Recreation Leader, (softball coach, swim team coach, playground leader, tennis instructor, adult sports coordinator, and day camp counsellor). In the summer of 1979, I was approached by the mother of one of the day campers, while working at the “Catskills West Day Camp” on the grounds of the Greystone Mansion, in Beverly Hills. She wanted someone to lifeguard her two sons and their buddies during a birthday party in their pool in Beverly Hills north of Sunset Blvd. I took the job and brought games to play like water balloons, coins for swimming to the bottom of the shallow areas and relays. I worked that job 4 hours. She was very pleased and gave my name to 3 more parents. The following year, I worked five birthday parties and started asking for more $$. 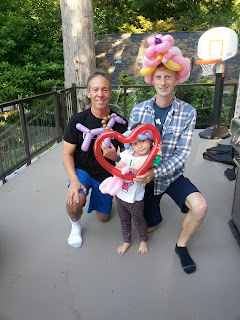 The Fall of 1980 I took on a partner, who was a Juggler, and refined my activities to 4 segments: Guitar and Songs, Arts & Crafts, Parachute Games, and the Juggler. I began advertising in a parent magazine and grew the frequency and location of parties from 5 to 15 per month in a span of a year. At that time, I was a Pre-school Teacher for the City of Beverly Hills .I was seeing kids 7 days a week. I started talking to my roommates like they were 5 years of age. After five years of working with the juggler, we split up and I started working solo. His juggling of machete’s too close to the audience scared the crap out of me. In 1982, I stopped the Arts & Crafts, put together a magic show, started making balloon animals, and kept the guitar and active game segments. I learned magic tricks and juggling. I was now doing an average of 25 parties per month and that year I performed 321 parties. I had unlimited energy back then. I took on some clown gigs that year to help increase the number of parties but also took a lot of horn honks and heckling from other drivers. I had the pleasure of entertaining kids in hospitals as part of the “Starlight Foundation” program. I performed in Southern California for 26 years. 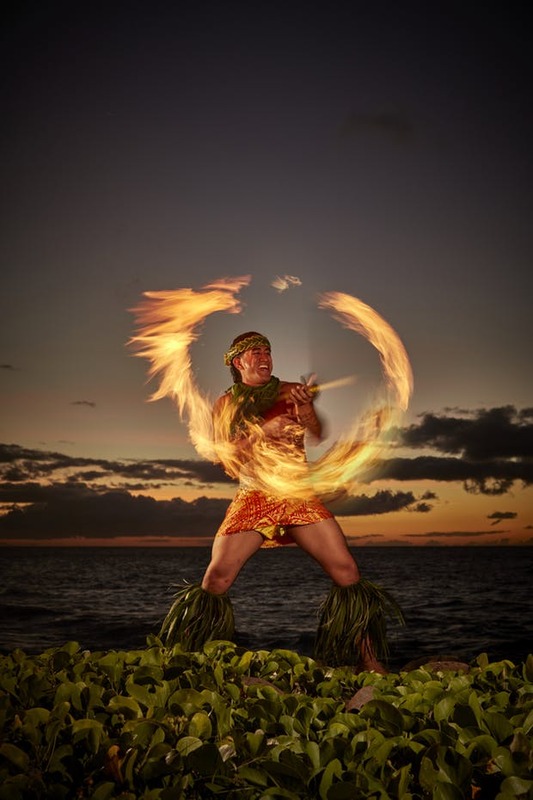 I’ve been performing here on Maui for 11 years. Kathy: Briefly share with us your life in California and your marriage to a Hollywood actress. Was that relationship helpful with Hollywood connections that expanded your business to celebrity party gigs? Tell us about some of those parties or most memorable moments. Artie: I was living in Venice, California in 1984. I loved Venice. Full of life, the boardwalk characters, bike path, beach, pier, restaurants, etc. At that time, Rhea Perlman from “Cheers” saw me at a birthday party in Los Feliz. What a sweet lady! She hired me 6 times to entertain her and Danny DeVito’s 3 children, and she paid me double each time. Soon I was meeting more celebrities and performing at their children’ parties. My list includes: Tony Danza (4 gigs), Keifer Sutherland (3 gigs), Mark Harmon and Pam Dawber ( 2 gigs), Candice Bergen and Louis Mal, Chevy Chase, Robert Zemekis, Phoeff Sutton (at least 10 gigs), Michael Ovitz, and Jonathan Winters. Rhea got me in to see 3 tapings of “Cheers,” one of which was the 10th year show taping. I got the chance to go down to the bar set and drink a real beer on tap, not the Martinelli’s they served during taping. They had a live band on the set, Rhea asked me to dance, I gladly accepted. Rhea invited my wife and I (see below) to the DeVito’s 4th of July Party at their other home in Malibu. Awesome party! The best! Among the guests were: Ted Dansen, Keifer Sutherland, Rob Reiner, Cher, Gregory Peck, Bebe Newirth, Faye Dunaway, and plenty of character actors that you’ve seen on TV and film. In 1986, while performing at a birthday party at Griffith Park’s “Travel Town,” I met Jeanne Russell. She is now a Chiropractor in Toluca Lake, CA. But as a child she played “Margaret Wade” of TVs “Dennis the Menace.” We married in 1987. 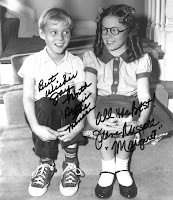 Through her connections, I got to meet and become friends with Jay North (Dennis the Menace), Paul and Patty Peterson (Donna Reed Show), Jeanne’s brother Bryan Russell (Disney child actor), Jon Provost (Lassie), Tommy Rettig (Jeff’s Collie), Troy Donahue (film, “Hawaiian Eye” & “Surfside 6” TV. shows, and Tony Dow (Leave it to Beaver). 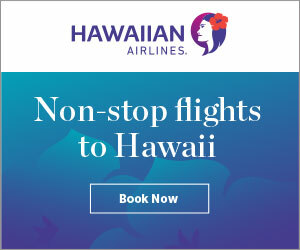 Kathy: What brought you to Maui? 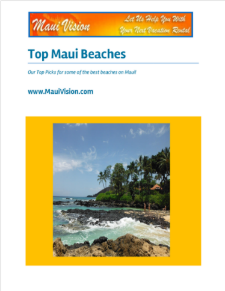 Maui calls many of us what was your wake up moment to relocate here. Artie: My now x-wife and I vacationed her on Maui one week per year for 12 years. We lodged in Kahana and enjoyed that side of the island. I started to get enchanted with the spirit of Aloha: the people, the music, the ocean, the clean air, the land, the rainbows, the trade winds, and a more tranquil way of life . . . . . you get the picture! Each visit, I purchased music CDs and took them back to California. I listened to them repeatedly and started to learn some of the songs with guitar and their meanings. My favorites ranged from The Ho’opi’i Brothers, Ray Kane, Braddah IZ, Dennis Pavao, to Hapa, Brother Nolan, Keola Beamer, and Raiatea Helm. I felt that Hawai’i was calling me home. My wife and I started growing in different directions. We had been saying that we’d like to live on Maui. But when it came down to making a decision about our dream, I was the one willing to make the dream come true. So, in 2005 I started to make plans to plant some seeds here. She promised to follow if I became successful. I did within three months, and she did not follow. So we ended our lives together as husband and wife, but we continue to be friends and stay in touch. Kathy: Any words of wisdom or inspiration you can share with our readers? Who is your inspiration? Artie: I believe in “Mahalo Ke Akua!” Thanking God, or if one prefers the universe for all blessings. It’s so important to have an attitude of gratitude. Hearts open up to me; doors of opportunity do as well. I’m grateful for the gift of sharing joy with children as a profession. One of the great pleasures of life is to enjoy your work. And working as a children’s entertainer and exchanging laughter with keiki keeps me motivated to continue. As far as comedy hero’s for inspiration, I never get tired of Curley Howard (the best of the Three Stooges), his physical comedy was fantastic. Jackie Gleason is one of my all-time favorites. Benny Hill was an absolute comedic genius. Standup comics Robin Williams, Richard Jeni, Rodney Dangerfield, Lewis Black, Damon Wayons, Gabriel Iglesias, and Ron White are at the top of my list of American Comics. 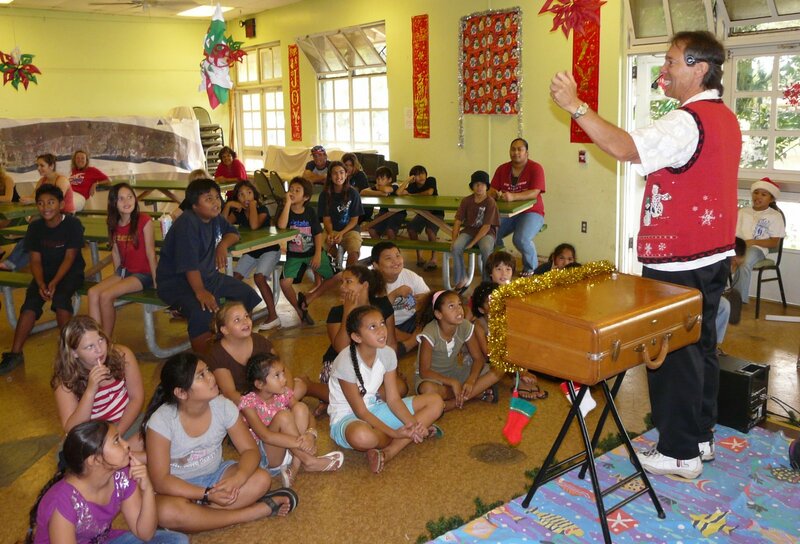 My favorite Hawai’ian comic is Rap Reiplinger, he could do so many characters in so many different situations. My favorite skit is “The Auntie Marialani Cooking Show.” He can still crack me up after seeing it more than 15 times.